Are you going on a trip to Poland? Do you already know what to eat in Poland? If no you are in the right place! In this post, we recommend you what to eat in Poland. Most of those dishes you can get in all parts of Poland, so wherever you plan on going, you just going to need to pick the right restaurant and try it! 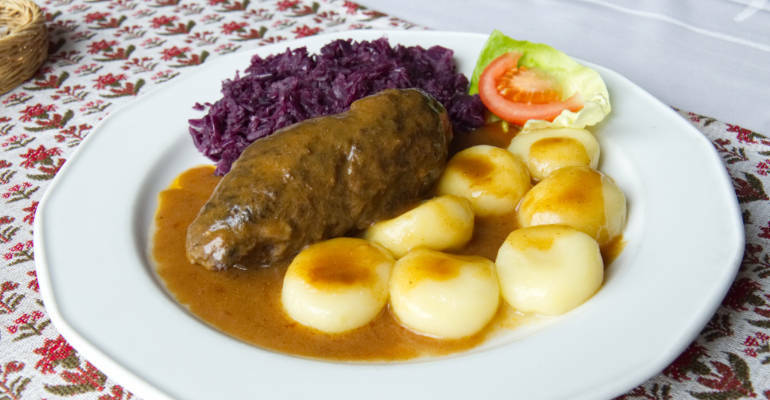 Polish cuisine is rich in meat and winter vegetables. We eat a lot of potatoes, dumplings, and grains. The preparation of most of those dishes is very time-consuming, but on the other hand, they taste like heaven. So now let me introduce you to the meals I miss the most while living abroad. Krokietki are pan-fried pancakes filled either with meat and vegetables or sauerkraut and mushrooms. 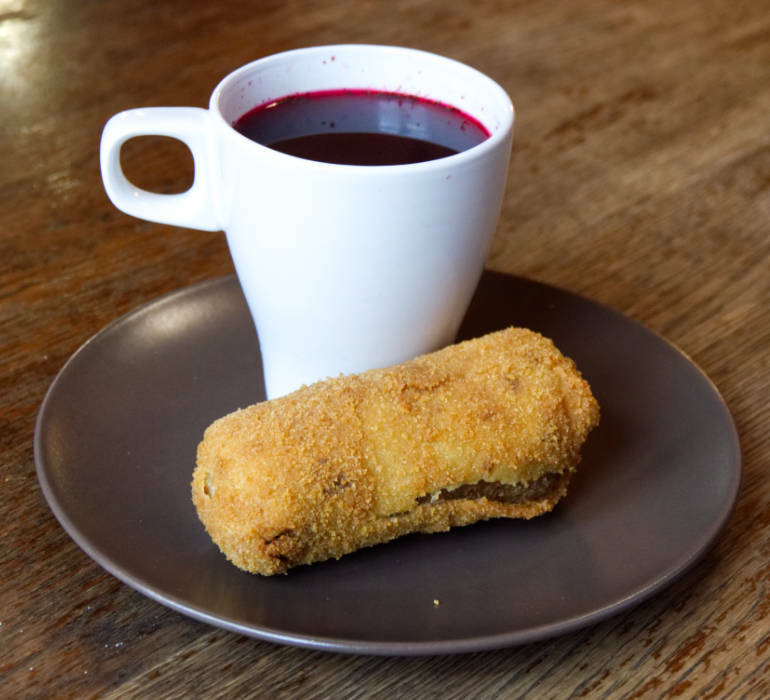 They are served warm with clear beetroot soup on the side. The filling contains cooked meat and vegetables which are then minced together and seasoned. They are crispy from outside, and the filling is soft and moist. Pierogi ruskie are dumplings filled with potato, quark, and fired onions. Usually, they are served with additional chopped fried onions on the top and sour cream on the side. You can also find pierogi filled with meat and vegetables, sauerkraut and mushrooms as well as berries. Our favorite pierogi are ruskie; not even the meat can beat the excellent potato-quark filling! If you wonder how to make them yourself, please check this recipe: Traditional Pierogi Ruskie Recipe. Golabki, which you translate to pigeons, are made from boiled cabbage leaves wrapped around a filling of minced pork or beef, chopped onions, and rice. On the top of golabki, you can usually find tomato sauce. Poles also have Christmas version of golabki that is made from mushrooms and cook rice, which is my favorite Polish Christmas dish! If you wonder how to make golabki here is the recipe for you: Polish stuffed cabbage rolls with meat. 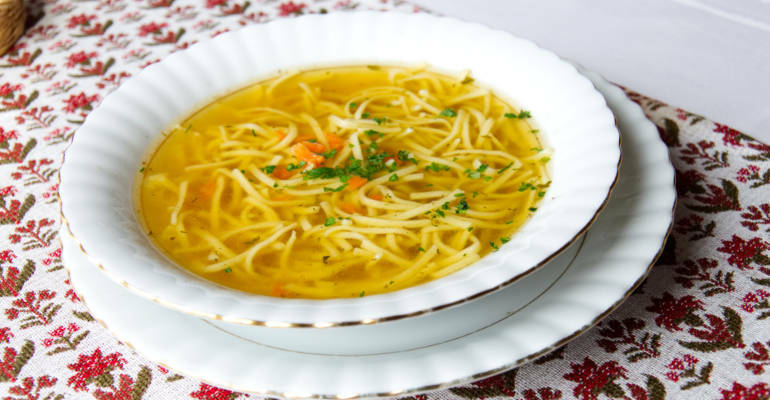 Important soup to mention is Żurek. The soup contains sourdough, smoked bacon, boiled sausage, cooked egg, and potatoes, at least in my family. We eat Zurek traditionally for Easter, but it’s also popular in other times of the year. The soup is thick and has a sour taste. I love it! 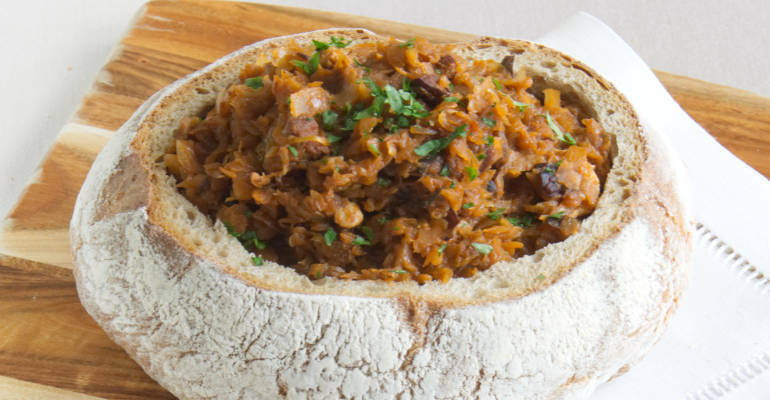 Another authentic dish that we would like to show you is bigos. Bogos is a cabbage stew, made from sauerkaut, cabbage and different kind of meats. At my home, we add bacon and fried sausage to it. Richer versions contain beef, pork cubes, and mushrooms. 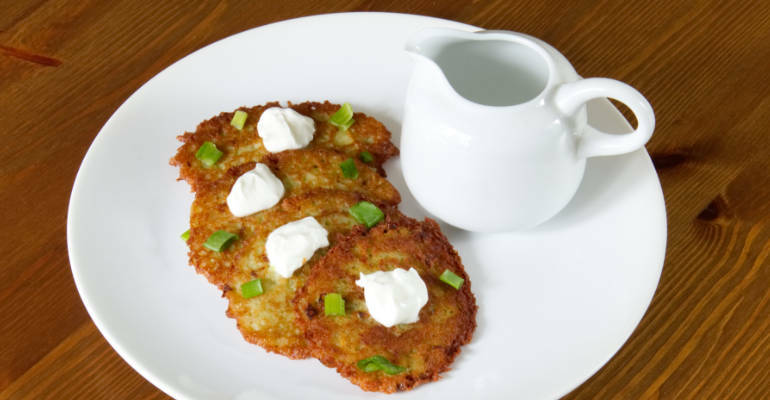 Potato pancakes with sour cream are very popular in Poland. I am aware of the fact that this is the national dish of Belarus and that they are famous in East and Middle Europe, but I think that the way we prepare them is very particular. 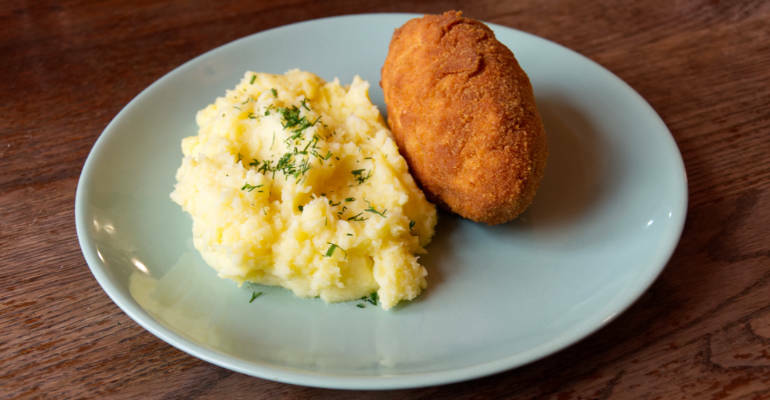 In Poland, potato pancakes are half cm thin, and the potatoes are very finely grated what gives them a fantastic texture. They are crispy from outside and soft from inside. Usually, they are served with sour cream on the side or beef stew. Cutlet de volaille is a fried chicken filled with butter or cheese, coated with flour, eggs, and breadcrumbs. The dish despite the french name has been developed in Russia and came to Poland after II World War. The chicken is crispy from outside and soft from inside. It is a deliciousness! Traditional polish cucumber salad – Mizeria contains sliced or grated cucumbers, sour cream spiced with salt, pepper, dill, vinegar, and sugar. The mixture is very refreshing and usually served with breaded pork tenderloin and potatoes. The last two dishes I would like to mention are dishes from Silesia, and I am not sure if you can find them anywhere else. Rosol is rich liquid made of water in which bones, meat, and vegetables. In Silesia has been made with homemade pasta. The broth is served as a starter on every Sunday in Silesian families followed by filled rolled beef served with potato dumplings. The list of traditional polish dishes is long. Therefore I couldn’t include all of them in this post. I think that all the dishes mentioned are a great start for you to discover polish cuisine. I hope this article helpt you with finding answers to the what to eat in Poland question. 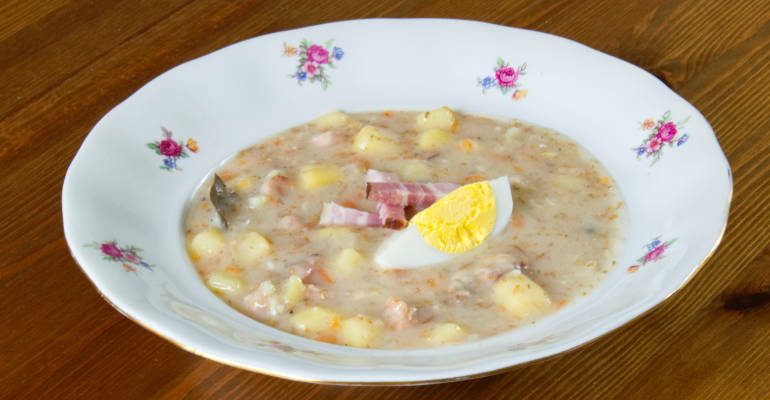 If you are looking for traditional polish recipes, you will certainly find them on our blog! I am very excited for you to tell me what polish dishes you like the most. Please share!